We have developed many innovative systems and products that have enabled our customers to gain a competitive advantage in their own businesses and markets. We are continually evolving with technology to meet the industry and our customer needs. The Quasar RCC module provides high-speed capture of electrical parameters with a given number of seconds before, and after a trigger event and sends a signal to control devices on the back of a trigger event. The RCC application is designed to meet or exceed the regulatory requirements of the New Zealand and Australian generation markets. The module provides high speed monitoring of electrical parameters for a period with a given number of seconds before, and after a trigger event. Trigger events may be under/over frequency or voltage. It combines high-speed monitoring, recording and presentation in a graphical format along with the raw data. Frequency triggers are sampled at high-speed every ½ cycle to initiate an event capture. Recording of parameters occurs for periods before and after the trigger event according to two data-sets. A system of aggregating energy and power values from multiple devices locally without relying on remote software. Used for multiple generators at power stations or multiple feeders at substations, the Master meter polls information from Slave meters, and computes the aggregate values. This method ensures the highest level of security by performing aggregation at a single 'point of truth', and at the closest point to the place of measurement. 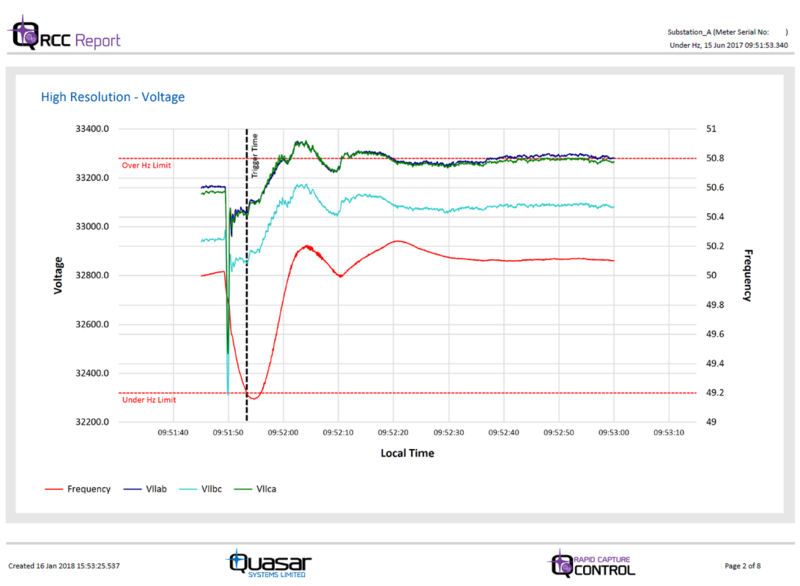 Quasar provides a powerful solution for Power Factor Correction as applied by an electrical power utility to improve the stability and efficiency of the transmission network, or installed by industrial or commercial customers to reduce the costs charged to them by their electricity supplier. Based on ION Enterprise software and ION meters, the design of this value added feature allows for up to six stages of contactors/capacitor banks and up to 31 steps of control. By including the ION Enterprise software to the system, on-screen displays of real time operation, system setup, and logging is provided, as well as complete control over frequency of switching, capacitor discharge time, and 'Stage Recur' etc. Smart meters installed at kiosk transformers at 11kV / 400V substations provide real-time and historical information, crucial to managing a distribution network. Advanced ION Meters & EcoStruxure Power Monitoring Expert Software. Monitoring transformer demand, operation, and health throughout the distribution network using the advanced ION Meters and EcoStruxure Power Monitoring Expert Software. Power quality has never been more important than it is today for both suppliers and consumers. This is due to the increasing presence of induced harmonic voltages and currents in the electrical supplies. Harmonics, voltage sag/swells, transients, and poor power factor all contribute to an increased risk of serious damage to electrical plant and equipment and the consequent high cost of repairs, plus loss of supply and the consequent customer dissatisfaction. Quasar's Power Quality Monitoring provides complete solutions for monitoring, alarming, reporting and alerting of Power Quality Events.